Well,good news on the FME. This morning looked it over yet again carefully and decided to try re-soldering some joints just in case I missed something. Sure enough,somewhere along the line during my earlier attempts I must have heated a joint on the PLL IC and a diode that is soldered between 2 pins was lifted on one of the pins.It was not making a connection so fixed that,powered it up and it locked immediately. The green LED was solid and appeared on the proper dial frequency as the dip switches were set. Pretty happy this morning and now feel this thing is not a piece of junk after all these years. The diode and cap on the foil side was some sort of additional mod by the designer and was easy to overlook.I am not sure why I do not have the capacitor on there,maybe I had taken that off years ago during an attempt to get it working.I need to put that in place again. Thanks for the suggestions by those that posted.I tried every single idea and was appreciated! Good for you! It's always something simple that gets you. I have free time today and will dig up some additional caps missing on the foil side and try it again.If all goes well,will insert the exciter back into main case,wire in the stereo gen / amp and try again.If I get it to transmit clean and lock yet,will insert audio and see how it sounds. I think the 50w dummy load will do fine for a short run. Thanks again to the group for suggestions and hope it helps others who may find this info. I was fooled and the PLL does not lock yet. It acts much better with everything I try new,but still drifts off frequency when I touch the RF transistors to see if they are getting hot. It should not do this when properly locked. I may break down and just replace all IC`s,clean all sockets and replace the DIP switch.Also going to replace the 2n3904 with a 2n2222 since I have a bunch.They appear to be nearly the same thing. Already for the third time rewound the PLL coil as I wanted it to be perfect and eliminated from the equation. Replacing RF chokes seems unlikely,but may do so just to do it.Same goes for ceramic disc caps. Total rebuild as I am tired of trying to play a guessing game.Most of the parts seem to be inexpensive anyhow. Could be when I cleaned the PCB using alcohol,some debris may have been trapped in the DIP switches as well as IC sockets. I can get it to turn on and with a small amount of effort get it to show up on an FM receiver.But when I tune the entire FM band,it also appears in other portions of the spectrum just as loud and clear.This is expected as I am only a few feet from the receiver using dummy load.But it still should not drift off when touching anything on the PCB.It does the same thing with all IC`s removed...so still not working like it should. Very sad that it was working so well when first built over 20 yrs ago and a shame to leave it broken.Sort of feel it should be repaired just for the sake of the huge efforts I made in the beginning to build it to begin with.Part of me says not to bother and leave it as a conversation piece since it is really not useful as it is against the law to operate with antenna.But it was pretty neat having wireless music anywhere around my property even on dummy load. Today will do a clean up of sockets and may try A FIXED setting for DIP switch by bridging the PCB pads. Will continue to update this posting for the record. Gotta keep us posted, Jim.....this issue reads like an old John LeCarre novel. Need to see how it ends! I ordered 4 of 6 new IC chips from Arrow that had free overnight shipping.They came in an hour ago this morning and anxiously swapped them out.No change in anything. This is the most baffling circuit I ever worked on. I broke down and ordered the last 2 IC chips and all will be new and fresh. Could be that one of these final replacements holds the key to working or not. I have the DIP set for specific frequency,but showing up center of FM band.I can fine tune the output and tweak the frequency,but for sure not locking on selected freq using DIP switch. I now wonder if BOTH PLL chips are now DOA. If the original issue was the PLL and I replaced with the new PLL,could have also ruined that.I may hunt down another PLL which is the hardest to find for this thing. Going to tinker around with DIP switches although they tested working perfectly. Almost tempted to pull all IC sockets and replace.Maybe some debris got into them even though I cleaned each one best way possible? Maybe something got under the sockets and shorting out some pins...who knows.Grasping at straws at this point in the game. based on the issues you are describing, im very positive the problem is on this PCB. i dont think its faulty IC's or the DIP switch, especially if the frequency is changing if you put your fingers near it. 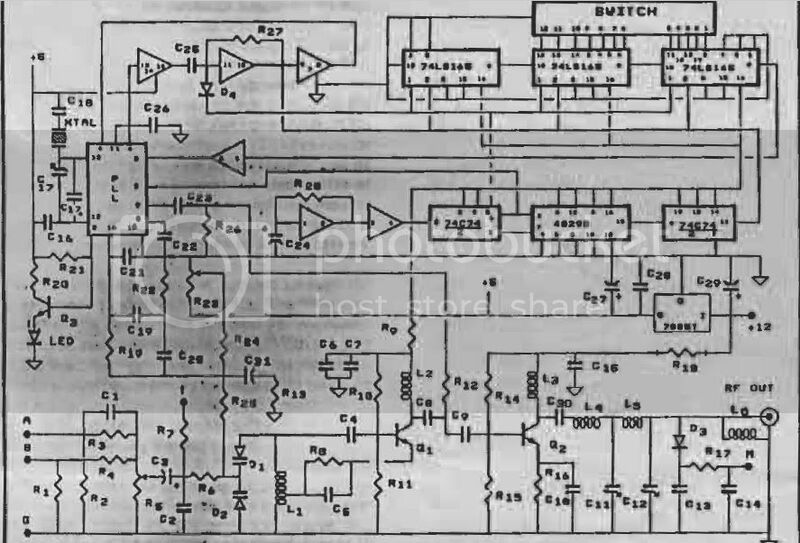 Can you post a schematic? 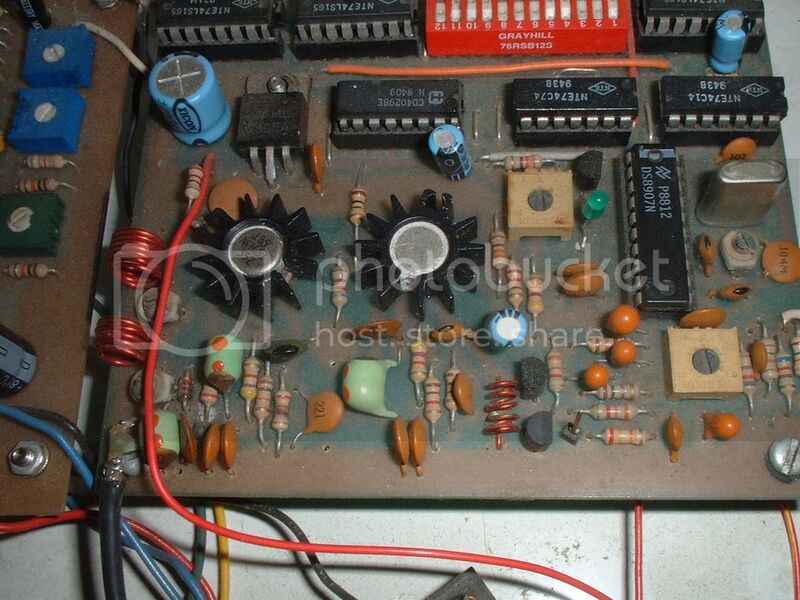 Not the whole thing, just the part with the PLL chip, the DIP switch and the oscillator. The "loop" must be broken. I have manuals for amp / FME and stereo generator. Just to eliminate repetition,will list all things I DID NOT replace since it is much smaller than what I already replaced. DIP switch cleaned and tested. All solder joints fluxed and fresh. 5 turn coil and tap new. Next,I will replace the 2n3904 with 2n2222 as I have plenty. Also,will replace 4148 diodes with 914 as I have a bunch of those too. Will see what I have for chokes and ceramic caps and replace what I can. 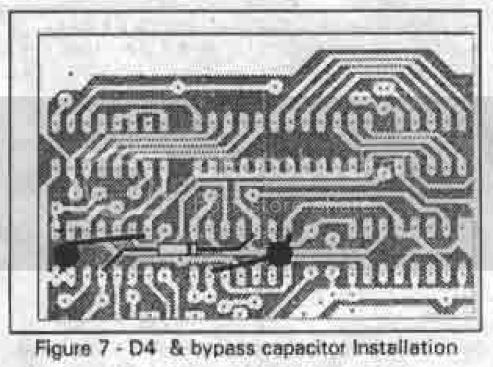 id be leaning towards (in this order), the ceramic disc capacitors, diodes and small transistors (assuming the smaller transistors are not the common NPN/PNP type) since they are more critical in circuit and susceptible to damage. My list of NOT changed is so small,may as well replace these things. Ceramic disc and diodes are simple and cheap enough,may as well. The diodes to my knowledge can be either 4148 or 914`s and the 2n3904 can be swapped with 2n2222. I already replaced the larger RF transistors and just the 3904 left. I will have to see if I can find a pair of MV2113 diodes somewhere. Looks like I am SOL regarding the MV2113 or MV2114 diodes. Can not find them anywhere. definitely look into the hi-z/ceramic disc caps and the variable trimmers - in my past experience, those were usually the culprit of the PLL not locking, frequency drifting and changing when you put your finger near the circuit. you might be able to find which one has the issue by dripping drops of freeze spray (upside down car of compressed air) onto each component while monitoring the TX on a nearby radio to listen for changes in frequency.